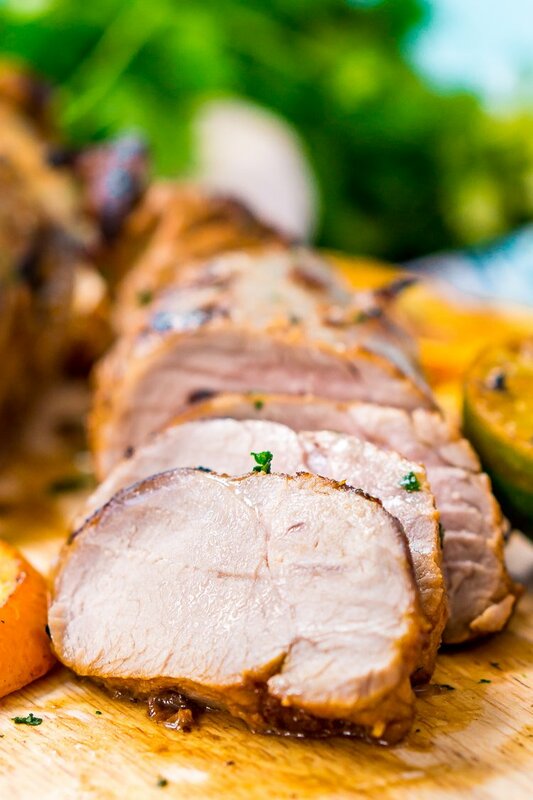 Cuban Mojo Pork is a delicious and easy pork tenderloin recipe made with freshly squeezed orange and lime juices, crushed garlic, minced cilantro, cumin, salt, and pepper. Cuban Mojo Pork is a tasty and easy family favorite. 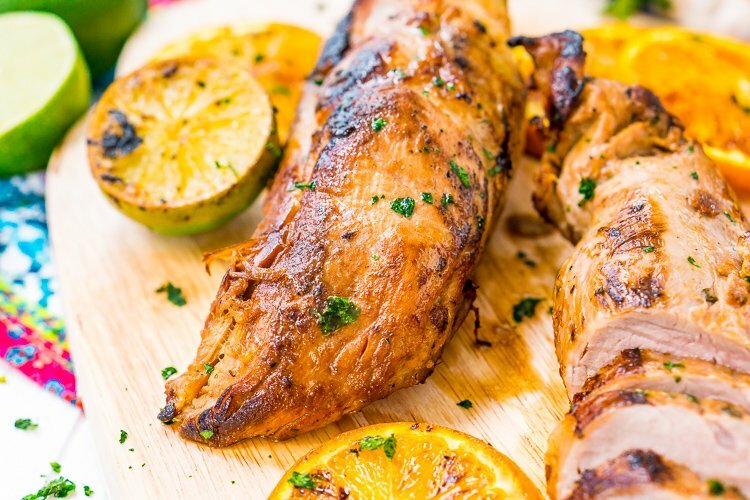 Most of the prep work is in the marinade which yields deliciously vibrant flavors of citrus, cilantro, and spices. Marinades allow you to take tough cheap cuts of meat and with a little time and the help of an acid or two break them down making them more tender and imparting a whole bunch of flavor. However, there is no rule that says you can’t use the same idea for a choice cut as well. We actually prefer to make Mojo Pork with pork tenderloin. JUST TAKE ME TO THE CUBAN MOJO PORK RECIPE ALREADY! 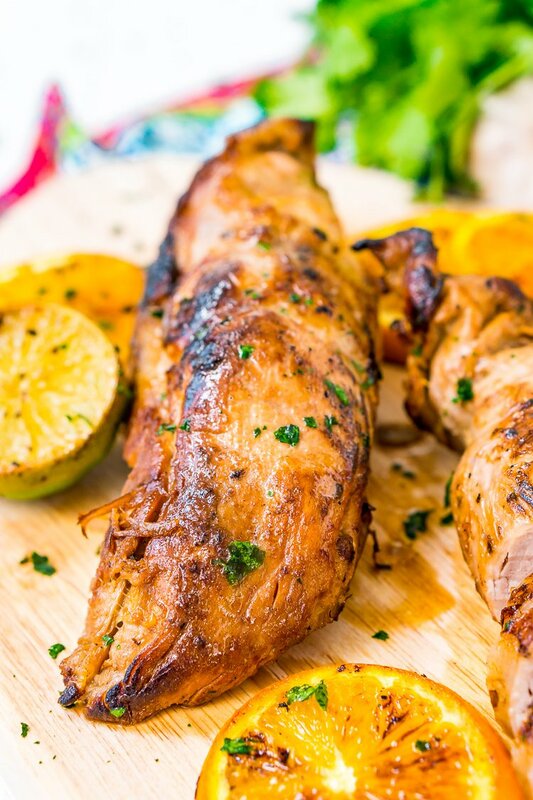 If you’d rather skip my (very helpful, I think) tips and tricks, essential cooking info, and similar recipe ideas – and get straight to this deliciously easy Best Ever CUBAN MOJO PORK Recipe – simply scroll to the bottom of the page where you can find the printable recipe card. What is Cuban Mojo Pork? Mojo Pork is an essential ingredient in a Cuban sandwich, and a darn tasty meal all by itself. Traditionally it is made with pork shoulder and the marinade is a mix of citrus, garlic, and cilantro. In this case, I’ve used pork tenderloin for a couple of different reasons. First is scale. When I get in the mood for a good Cuban sandwich I don’t want to have to deal with a whole pork shoulder. I mean seriously, a roast is great, but I’m not letting my weird Saturday afternoon craving determine what I’m eating for the next week and a half. Buying a section of pork tenderloin gets me to the same flavor place without the waste. Second, and more important, is time. To really get a pork shoulder right it needs to set overnight if not longer. With tenderloin, I can have a ridiculous craving in the morning and be eating that night. A smaller cut of meat means a greater surface area for all that citric acid and sugar to work their magic on. It also means less depth it has to penetrate until the meat is saturated. Finally, I can also eat it with a fork and knife. While I love this combo for use on a Cubano it eats just fine as an entree too. In fact, I’m not above high roading people, calling this Citrus Tenderloin, serving it with some pan-fried asparagus (seriously people don’t cook asparagus any other way) and keeping the leftovers for my sandwich the next day. 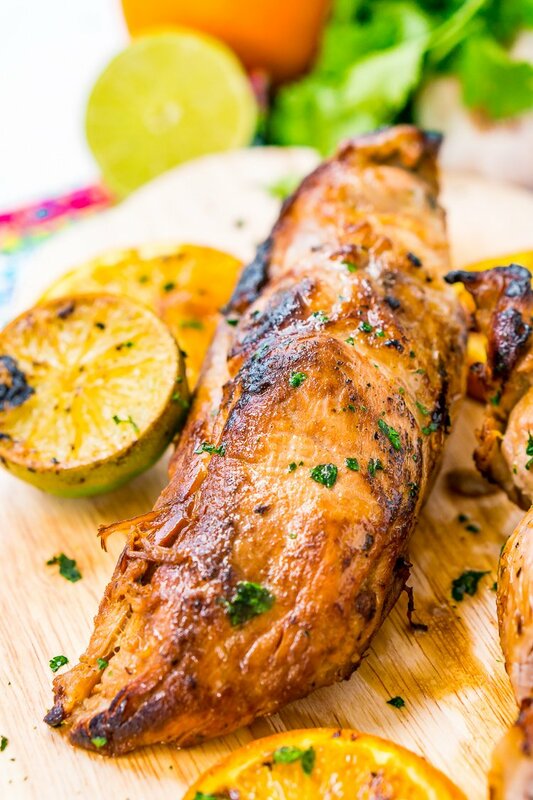 How Do You Make Mojo Marinade? To make a quick and dirty Mojo marinade, first juice two oranges and eight limes into a bowl. Then peel and crush a whole bulb of garlic. To do this super quick just put the bulb on a cutting board, place the heel of your hand on top, and rock forward putting your weight down on it. This should separate the bulb into individual cloves. Then place the flat of a knife over each clove individually and press down again (more gentle this time). The peel should come away easily from the clove and the garlic should be a little crushed. Add the garlic to the bowl along with a quarter cup of freshly chopped cilantro. Finally, whisk in your cumin, salt, pepper, and olive oil and transfer the marinade to a gallon sized bag. I like using my Baggy Rack to do this, especially when I’m preparing it alone and need an extra set of hands to avoid making a mess! My Favorite Baggy Rack!Buy Now! Now some of you Mojo efficiandos may call into question my small dose of cilantro here. That’s fair. If you really dig the aromatic power of cilantro, you can go right ahead and double or triple the dose, no one’s going to call the herb police on you. However, for me, this is one area where I like to show restraint. We’re already working with a good piece of meat and I want the citrus and sour notes to be the accompanying flavor and I find that a little cilantro goes a long way. Either way, the end result will be a piece of tender, juicy, and flavorful pork loin! How Do You Cook Mojo Pork Tenderloin? After you’ve made your marinade pour it into a plastic bag and add your tenderloin. Set aside in the fridge for six hours, (overnight if you can but 6 hours will get you 90% of the way there). Once the meat is done marinating, preheat your oven to 350 degrees F, and grab a cast iron pan, add a few ounces of vegetable oil and proceed to bring it up to medium-high heat on your stovetop. Take your tenderloin and place it in your hot pan allowing it 60 seconds or so on a side before giving it a quarter turn. After the third turn remove from heat and slide in your probe thermometer( more about that later). Set the thermometer to 145 degrees F and move the whole pan to the oven. It should take about an hour to reach the desired temp. Once done remove from the pan and allow to rest 15 minutes before cutting. Back to the thermometer. If you don’t have ready access to a wired probe thermometer with a magnetic back — correct that situation. They are pretty reasonable as far as price goes and they are irreplaceable in the kitchen. It takes all the pressure of cooking large pieces of meat and it literally lets you know exactly when to stop cooking it. Without one, you’re playing a dangerous game undercooked meat that loses all it’s juices when you cut it open the first time and dried out roasts that should have been pulled thirty minutes earlier. My Favorite Wired Probe Thermometer!Buy Now! 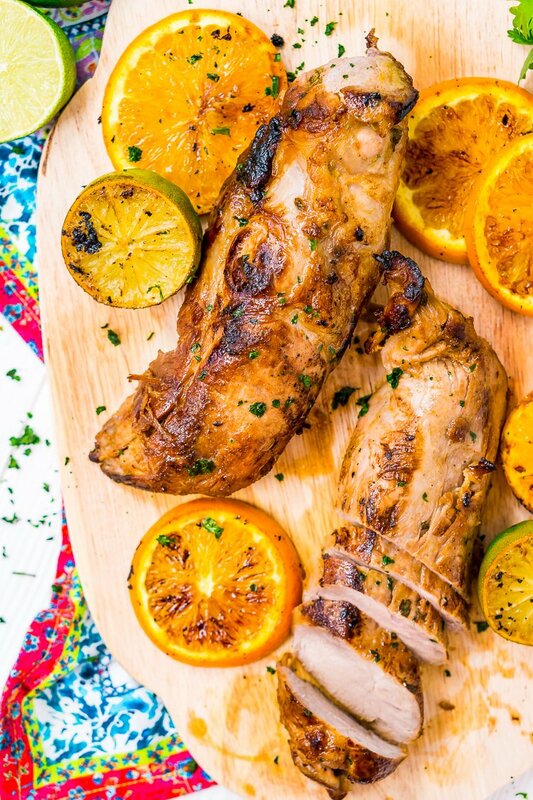 Pin this Cuban Mojo Pork Recipe for Later! Juice two of the oranges and all of the limes into a bowl. Add the garlic to the bowl along with a quarter cup of freshly chopped cilantro. Whisk in your cumin, salt, pepper, and olive oil. Pour the marinade into a plastic bag and add your tenderloin. Set aside in the fridge for six hours, (overnight if you can, but 6 hours will get you 90% of the way there). Take your tenderloin and place it in your hot pan allowing it 60 seconds or so on a side before giving it a quarter turn. After the third turn remove from heat and slide in your probe thermometer. If you really dig the aromatic power of cilantro, you can go right ahead and double or triple the dose, no one's going to call the herb police on you. If you don't have ready access to a wired probe thermometer with a magnetic back -- correct that situation. It takes all the pressure of cooking large pieces of meat and it literally lets you know exactly when to stop cooking it. Oh, this looks divine! I love a good pork tenderloin recipe. 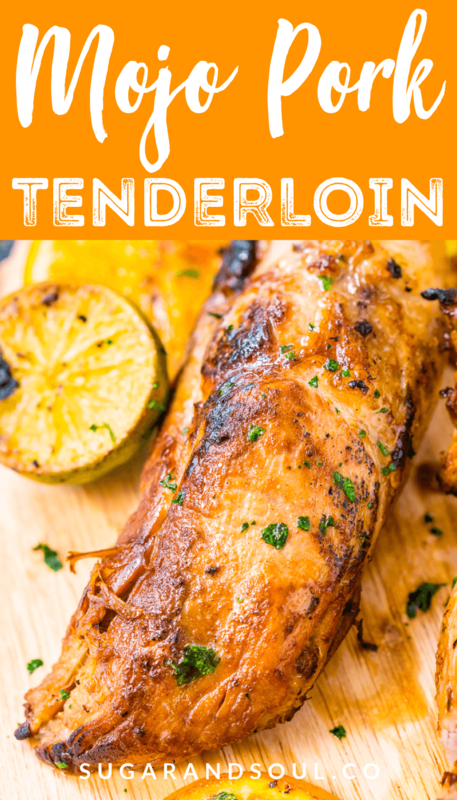 I’m always looking for new ways to make pork tenderloin, and this looks delish! You talk about sugar in your blog post, but there is no sugar. Are the carbs coming from the orange and lime? Thank you. Hi Barb, it’s natural sugar from the orange juice (a navel orange has about 17 grams of sugar in it), no additional sugars are added 🙂 The limes contain most of the citric acid that contribute to the marinade recipe and contain very little sugar. I hope that answers your question.